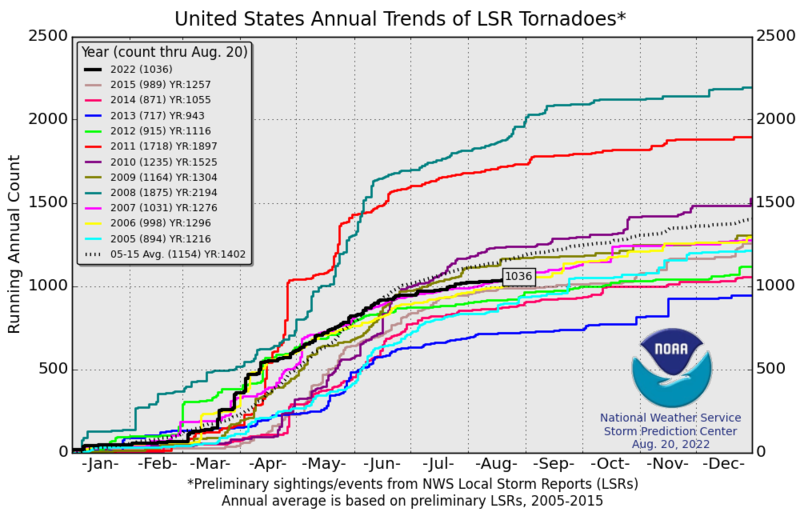 NOAA: U.S. Tornadoes lowest since 1954 – during the "hottest year ever" | Watts Up With That? NOAA: U.S. Tornadoes lowest since 1954 – during the "hottest year ever"
November 16, 2016 in tornadoes. ← President Trump: The Latest Excuse for Losing Climate Data? Unfortunately John Adams was not a climate scientist, otherwise he would not have made such a naive statement. And just what was it about the quoted John Adams statement that you thought was naïve? I am curious as to your reason for claiming it was “a naive statement”. Sam! Do people really have to add (SARC) when jerking your chain? Stick to the good stuff, like your 4:52AM posting which was most worthy. If you want to show off your naïveté, doing it privately is a better choice! Sam! Do people really have to add (SARC) when jerking your chain? tomwys, ….. just how was it possible for Greg to be “jerking my chain” when I had not previously posted to the lead comment? tomwys, ….. maybe you are confusing Greg’s use of a “double negative” as being simple “sarcasm”. So… you’re against facts? Interesting. True, John Adams was not a “climate scientist.” He actually had a brain and character to go with it. Yes Greg, you do have to put a /sarc tag on every time. Unfortunately straight text is not a good medium for conveying such subtlety. “Missing tornadoes hiding in the deep ocean. They’re preparing to come back with a vengeance” SOUNDS LIKE SHARKNADOS TO ME. The hottest year ever also happens to be a very strong NATURAL el nino year. Ken Stewart does a monthly UAH V 6 update for the globe and all the regions. The global warming trend since 1998 is just 0.23 c per century, way below the 1.2 c per century trend since DEC 1978. And the south polar region has been cooling since 1978 and the 1998 to present cooling trend is faster than the longer period. Here’s the link. And whenever you have a “hottest near-surface air temperatures year ever” …… you will also have the “hottest ocean water surface temperature year ever”. And whenever the ocean water surface temperatures are increasing ……. the ocean surface water is outgassing CO2 into the atmosphere. And whenever the ocean water surface temperatures are decreasing ……. the ocean surface water is ingassing CO2 from the atmosphere. The “Max” CO2 occurred at mid-May (5) of each year … with the exception of three (3) outliers, one (1) being in June 79’ and the other two (2) being in April 99’ and 2000. The “Min” CO2 occurred at the very end of September (9) of each year … with the exception of eleven (11) outliers, all of which occurred within the first 7 days of October. YUP, ….. like the ole farmers say, …… when the CO2 is “up”, and the humidity is “up”, and the temperature is “up”, ….. you can almost hear the fieldcorn growing at nighttime. Here is a more recent update. That’s not really an update. It is the product of bad stations and adjustments. I was pretty clear about the need to consider only good quality stations. Are you familiar with the surface stations project? A strong majority of stations have errors greater than 2 deg. C. Six percent of stations have errors greater than 5 deg C. Remove the garbage stations and you get little or no warming. But you don’t understand, a good station is one that agrees with the models. OK Tony, just for fun let’s assume the map is accurate. What dangerous effects is it having? Please explain rigorously with falsifiable assertions, and show us your math and physics. I wasn’t aware of that site Bob. Is there a map or graphical representation of the ‘good’ stations? … Is there a map or graphical representation of the ‘good’ stations? There’s a map a little down the main page showing the ratings of all the stations. Since you’re so good with the links, help me out here. All that data homogenizing and averaging requires a lot of computer software. What I’d like to see is the documented (best practices) process that they used to design, develop, and test it. I’d also like to see all the software peer reviews and verification reports as well. Unit tests and coverage reports would be a bonus. Why am I looking for these items? Good question. Because designing and developing computer software is prone to error, just like any other human activity. As a professional software engineer I know that even seemingly small errors in a program can completely invalidate the output. That’s why we have developed these software development specific processes. So, if NASA (or any other climate science groups) have not adopted and followed these processes, I have to assume that the output of their software is about as useful as an uncalibrated thermometer. The implications for not being able to find these items is obvious. Fair points you make Paul. You’ve probably forgotten more about software engineering than I know, so you could probably just tell me the answers to your pertinent questions. Be quicker. I posted the map because when I went to the links I found they were four and six years old. I don’t doubt the map has some inaccuracies, is there a more accurate version? If I understand the mechanics of thunderstorms and tornadoes, much of the intensity depends on temperature differences. So, as the arctic regions are warming rather more than lower latitudes, there is less temperature difference to drive tornadoes. So, a lower number and intensity of tornadoes is consistent with global warming. BUT IT IS NOT SCARY! So the advocates misstate something that is support for their main claim. Typical. Nothing scary about a dead canary. Is there in fact, a dead canary somewhere? There’s also nothing scary about living Nashville-ites or Topekans (I arbitrarily choose two cities where tornadoes might cause havoc), unless of course you’re one of those radical Malthusians who hates living humans and wants to reduce our numbers. Are you one of those Malthusians, Tony? In your case that canary is nothing more than a plushy. A dead canary is not scary unless you happen to be down a coal mine. One degree higher temps at my place in the sub-tropics is a mere inconvenience and in Calgary I’m sure it would be welcome. Right now there are extraordinary warm anomalies – Null School was showing +0.1 at the pole a couple of days ago, so yes the Arctic is warming faster than anywhere and the anomalies are 6, 8 12 degrees C above the long term average. The thin arctic ice is the canary. 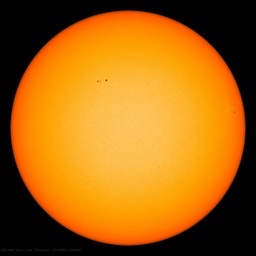 It makes for a wonderful indicator because it is so sensitive to temperature change – any global-wide changes will first become apparent there. If everywhere else continues to warm and ends up matching the Arctic then that would be fairly catastrophic. Dead, not pining for the fiords. I’m trying to figure out what is scary about finding buildings and forests under the margins of retreating glaciers. If there is warming, it would mean that we are heading for an enhanced environment with more room for homo sapiens to thrive and grow. and that area of cold is ways huger and has a lower anomaly, dwarfing the arctic heat. There’s no doubt the Donald has brought them all out in force. Brought them all out in FARCE, I think you meant to say. This has puzzled me for a while but I see its the usual deception at work. A”warmer world” would by basic simple physics have less severe storms, contrary to their claims. But if the world has not warmed, how come the decline in severe weather is occurring. 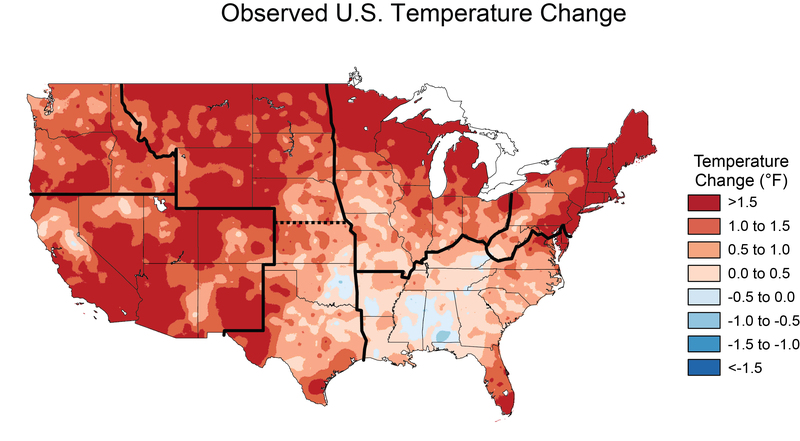 I think the answer is that the “average temperature has not gone up but the area where temperature gradients are critical in severe weather development has warmed up. Thus other areas have cooled. Something very similar to this argument has been used about hurricanes. Translation:- Facts are things that cannot be argued with. The problem is that the general populace have had their heads filled with non-facts and until MSM is prepared to publish the real facts nothing much will change. I bet this data from NOAA isn’t commented on in any MSM outlet. Excellent. If global warming is actually happening, the science says fewer tornadoes result. In contrast The Science, says there will be more, and these will be more catastrophic. A great illustration of how The Science is contradicted by the science. Except that is not what it says. Another article from the clutching at straws department. We agree that the alarmist Guardian is clutching at straws, tony. Thanks for standing with us on that one! For all the lying articles in the Guardian, daily, systematically misreporting climate, I never seem to see any catastrophist climate scientist refutations. I conclude that catastrophists agree with the lying Guardian! Yes but do try and bear in mind that all of it is settled at least. So, by “The Science”, you mean Climate Science™ and by the science you mean like traditional meteorology as has been taught for decades, right? Because I am pretty sure I was taught that extreme storms were caused by a difference in air mass temperatures rather than an absolute heat content. Crazy thought but, when tornado, hurricane, South Pole ice, tropic atmospheric warm spot, CO2-temp disconnect, + on and on, predictions all don’t pan out as they are supposed to… is there any chance that this is evidence invalidating the legitimacy of ground temperature station data? I have today emailed this story to the BBC Newsroom. Others might wish to do the same, in which case their email address is uknewsplan@bbc.co.uk It would be good to get the story sent direct to all the main news outlets, although we might guess what result will be. Every year, about this time (late October or November), we get a storm on two in UK. Yesterday BBC reported Tornadoes hit Wales and Midlands. What the hell is a “qango” ,anyway? Aussie slang can be obscure to an American at times. Warm the higher latitudes most……decrease the meridional temperature gradient….decrease some measures of extreme weather like this. When the atmosphere does not have to work as hard to equalize/redistribute the heat imbalance……there will be less extreme weather for some measures, like tornadoes. Warmer oceans and atmosphere do contribute to higher amounts of precipital water and higher rain amounts in some high end events but tornadoes should be less when heat is more uniformly distributed. What about 2013? Wasn’t it lower then when compared to 2016? This should be shouted out as an absolute alarmist lie-killer. Do it in a specific study. Hottest year ever but lowest tornadoes since records began in 1954 kills stone dead ANY correlation between tornadoes and temperatures. Such a provably-false claim CANNOT continue to be perpetuated. While I am by no means buy into any off the CAGW BSt, I think it is quite clear that cold does in fact make tornadoes or more correctly stated confluences of warm and cold air make tornadoes, so with out cold air masses you don’t have tornadoes. Acknowledging “gradient” is by no means a concession to alarmists. In fact it reveals their ignorance of the subject. Even the biggest alarmists, they should agree with the arrangements of science. I like the “Inflation Adjusted” part. Pity they don’t do that with surface temperatures too. The UN’s “weather bureau”, that’s a laff. More like politburo. You don’t understand. You can’t consider the raw number of tornadoes. That would be too easy. The newly developed tornadic inversion stupidity factor (TISF) doubles due to the mint-julep algorithm developed by Kevin Trenberth. This model proves that tornadoes are worse under a warming conditions in ways that simple observations can’t detect. I have to say, that chart is one of the most bizarre charts that I have ever seen. Basically, it is saying at the outset that we don’t really know how many tornadoes there are, but these are a few educated guesses. The asterisk note at the bottom says that adds up local count of tornadoes and multiply by 0.85 to “remove overcount”. May I give the basic meteorology governing the formation of tornadoes. No, it is not simply surface temperatures. It is the lapse rate. In the case of the US there are two main ingredients. Heat/moisture from the Gulf below. Cold/dry air from the Arctic above. Under AGW the Arctic is warming greater than anywhere else on the planet, so the cold/dry above will lessen. However the warm/humid below will increase. Depends on which one wins. On top of that we have year to year weather. The influence of ENSO FI. Basic AGW theory says that the arctic is supposed to warm the fastest. So, are you agreeing that basic AGW theory is nothing but nonsense? Wait, was this an ENSO year? I could have sworn that it was just an ordinary year, that’s why all the alarmists have been proclaiming that this year being warmer than the last couple was so significant. There is a correlation between tornado frequency and El Niño years, based on that a low number of tornados would have been expected for 2016. Along with Godzilla. Man, are we in trouble, or what? Why do you think Godzilla keeps showing up. With all those tornadoes it’s getting crowded down there. Might explain why he’s always so grumpy as well. They are down there, together, plotting what to do with the missing heat. The title of the graph leaves me confused. 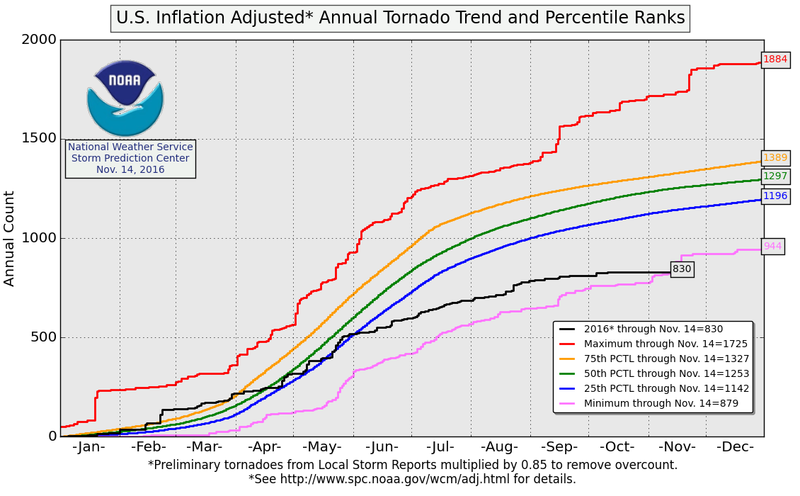 How exactly are the numbers of tornados adjusted for inflation? 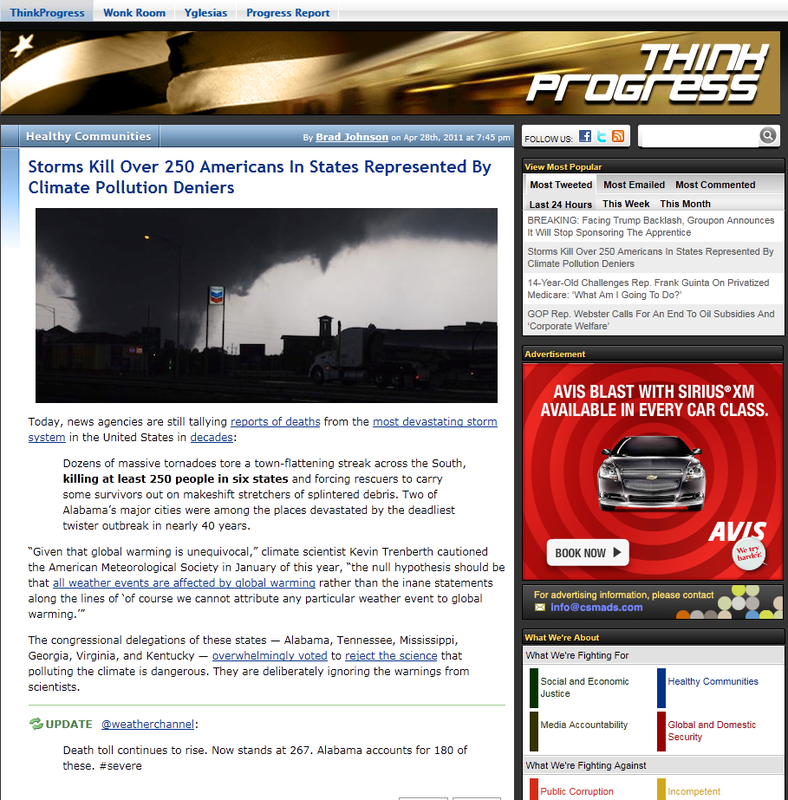 Are we now to assume that “economic warming” will increase tornados. If the recession deepens does the number increase or decrease? Perhaps an economic recovery will bring back the missing tornados with the vengeance of a scorned woman? Never mind I answered my own question. it appears as though the numbers are “adjusted” to account for 15% over reporting. How was the 15% number arrived at? Note the (*) asterisk. Preliminary count multiplied by 0.85 to reduce over-count due to local reporting overlapping reports. Tornadoes that are not actually witnessed are assumed to have occurred based on a number of observations, including wind speed. It is well known that this causes more tornadoes to be claimed than actually occurred, which is called “tornado count inflation”. So they adjust by assuming that 15% are over counts. Agree or disagree with the methodology, at least they are consistent and use the same adjustment for all years. I am sure that I saw a news report recently stating that due to CAGW there was an unusually high number of tornados this year. People will say the craziest things. IOW, Jeff, if it hadn’t been so hot there would’t have been any at all. Don’t you know that prior to a couple of years, tornadoes were no more than strong breezes that nobody ever worried about. They’re getting smarter! Starting to hide and camouflage themselves as windmills! Reblogging this as the alarmist claims that are readily believed by the public, and by the vested interest supporters, are clearly suspect. Claims of rising sea levels, weather extremes, coral reef deterioration, hottest “….” etc., are all distorted and /or inaccurate. Some people understand science and some do not. I am with Anthony Watts. -there is doubt as to what degree it is caused by human activity versus natural variability. But that the jury is out as to whether that is a good or a bad thing, but on balance, little or no change is likely to be the best condition for humans to continue to proper. As I say, that is my guess. Meteorologists are having a difficult time recalling a more amazing contrast. While the North Pole flirts with melting temperatures, Siberia is shivering in off-the-charts cold. The Weather Channel described the stunning side-by-side extremes as “one of the most bizarre juxtapositions seen”. The Siberian cold, up to 60 degrees below normal, has persisted for weeks. On Nov. 15, it manifested itself in more than 12 cities registering temperatures to minus-40 degrees or colder, the Weather Channel said. The area they speak about dwarfs the arctic and the cold anomaly is 2 times colder (-60degress) compared to the +32 degrees anomaly of the north pole. an area that’s double the size of the arctic, with a double negative anomaly then the arctic or in human terms: a massive record smashing cold doesn’t hit even the news…. also the warmer the pole the less contrast there is. even more moist air won’t win from a lower temperature gradient. The temperature gradient is what is called the lifted index (LI). Then you need colder upper dry air and moister lower warm air for higer CAPE. the warmer and lesser dry the dry air, the better the air masses do mix and the higher the dewpoint is and the less CAPE and LI you got. this is very simplfied it’s more complex as it’s also buoyancy, windshear, dryness and dewpoint related and i left out those parts in both. Mod , Was there a problem with my post about the nitrogen cycle? ?